Social media have become almost synonymous with the internet in the Middle East. Nearly all internet users (95%) use legacy social media or direct messaging; this finding is uninfluenced by nationality, gender, or age. 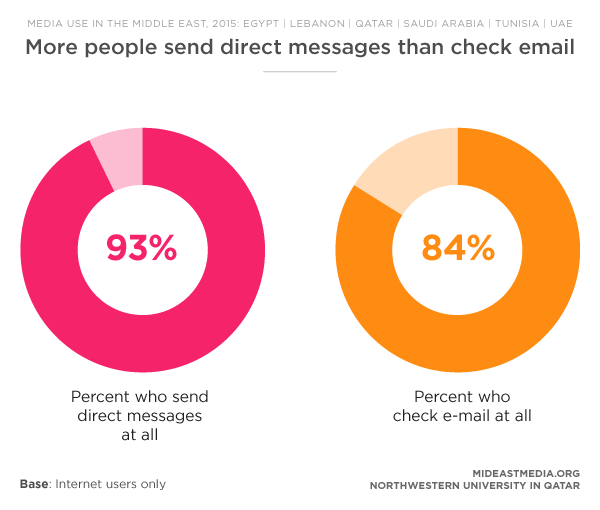 Staying connected and constantly “checking in” pervades Arab culture, as demonstrated by nearly eight in ten (79%) using social media or direct messaging at least once a day. Furthermore, nearly seven in ten (69%) use the internet daily with the express purpose of learning the latest happenings and events from friends and family, often checking in multiple times a day. Use of social media has surpassed other activities on the internet; people use social media far more than they look for news (55% daily) or download or stream videos (40% daily). Moreover, direct messaging is the more likely tool used to connect with others compared to email, among other activities online. Facebook remains one of the more dominant social media platforms by a wide margin among nationals who use the internet, although usage has declined since 2013. 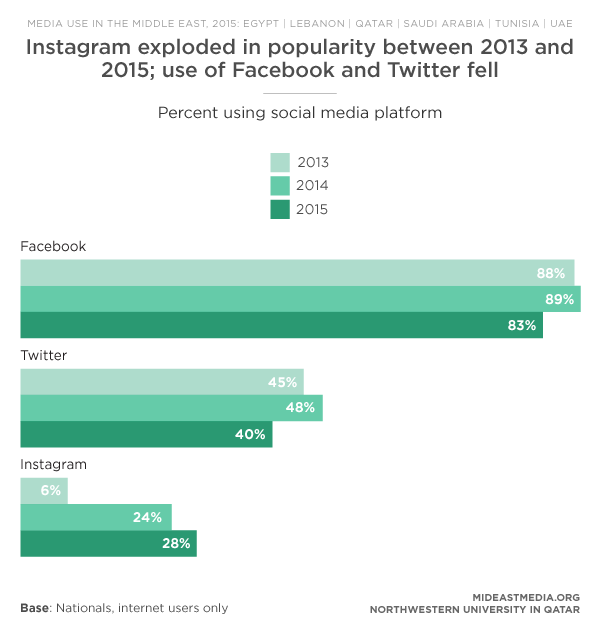 Use of Twitter and Google+ has also waned, while Instagram has risen sharply in popularity, particularly among younger adults. 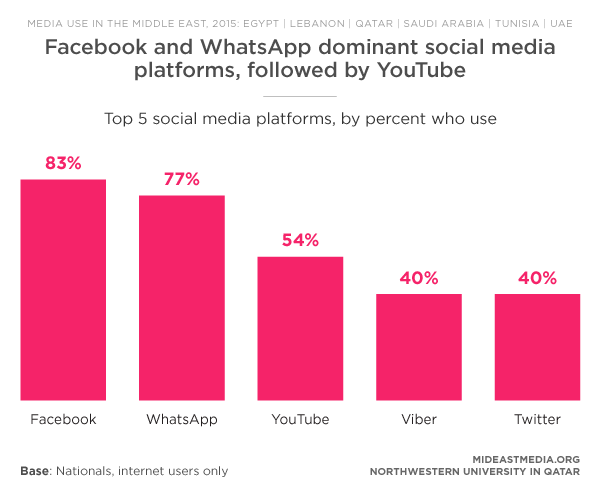 Facebook and WhatsApp are the dominant social media platforms in the region, both sites used by more than three in four respondents. High use of these platforms is consistent regardless of gender or age. 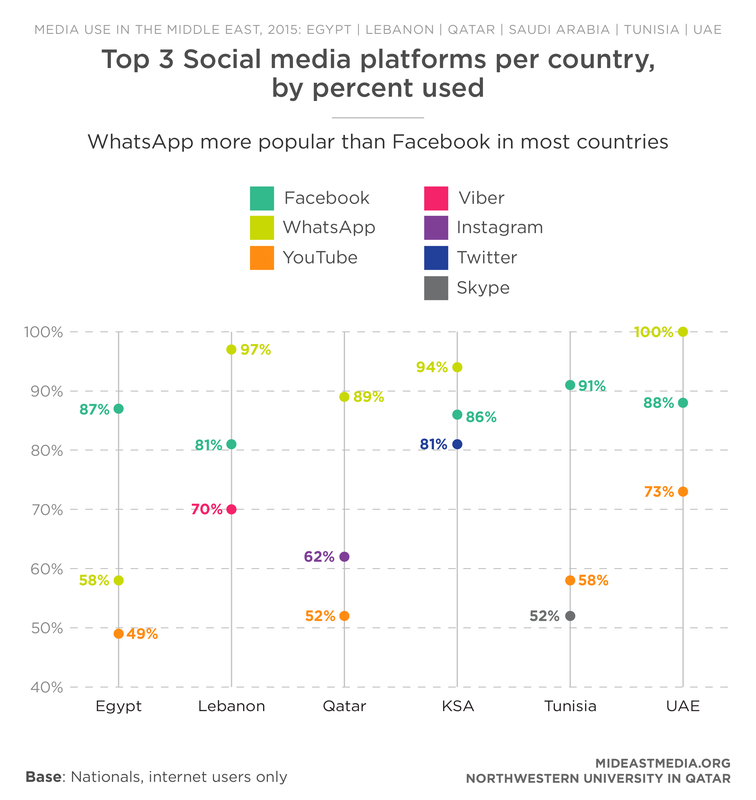 WhatsApp has become nearly ubiquitous in UAE, Lebanon, Saudi Arabia, and Qatar. 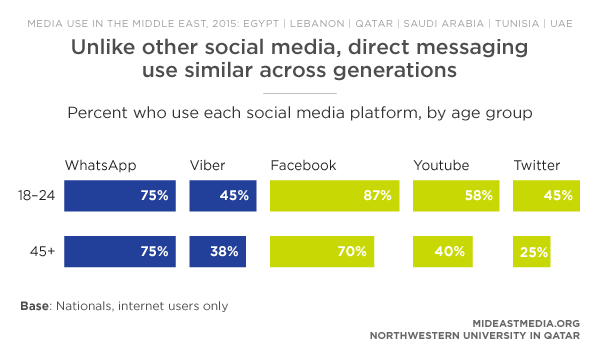 WhatsApp is less common in Egypt and Tunisia, where Facebook is the dominant social media platform. Younger adults spend more time online than older adults, and perhaps consequently are more likely to use multiple social media platforms. WhatsApp, though, crosses generational divides and exhibits robust popularity among all age groups. Text messaging has traditionally been a form of personal, one-on-one communication, but direct messages are also used to communicate with larger groups of people, thus expanding its appeal as a form of social media. 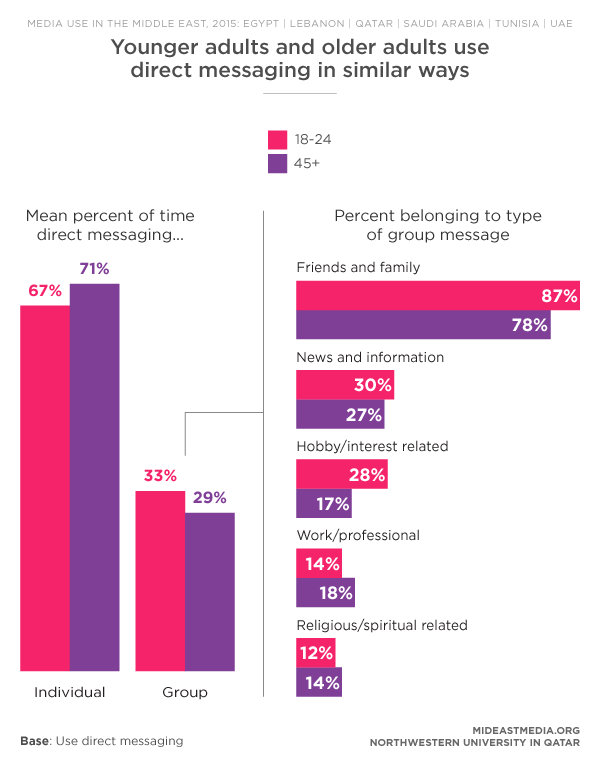 Approximately one-third of direct messages (sent or received) are among groups. Almost six in seven belong to a direct messaging group, primarily friends and family, and three in ten belong to news-related direct messaging groups. 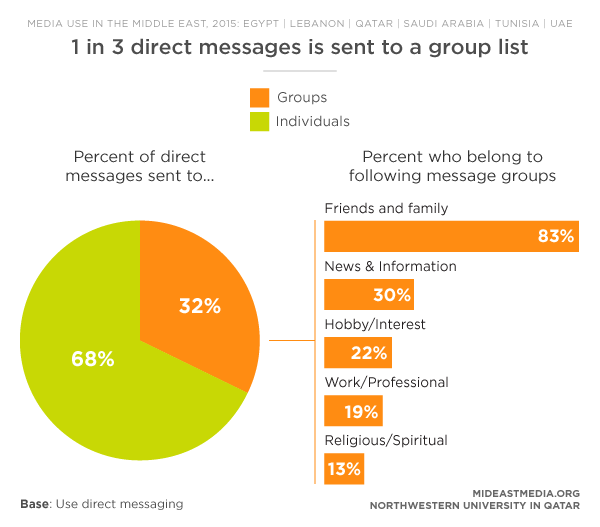 Lebanese direct messaging users are the least likely nationals to belong to a group (67%), contrasted with 96% of Emiratis who belong to at least one direct messaging group. Younger and older adults use group messaging similarly. Many in the region feel the internet is an effective amplifier of one’s political opinions. 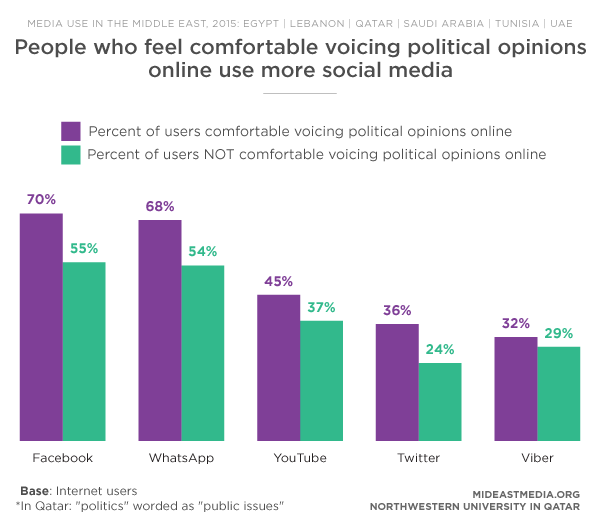 Those comfortable discussing politics in general and who feel it is safe to say what they think about politics on the internet generally are more likely to use social media platforms. However, attitudes appear to be associated only with the level of use of these services, and not necessarily preferences for one platform over another. 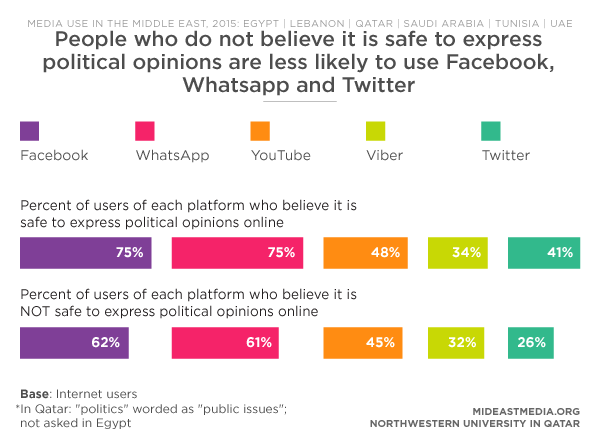 Regardless of respondents’ support for political freedom of speech, WhatsApp and Facebook remain the most popular services. Despite their daily use of social media, many internet users express concerns about government surveillance of their online activities. One-third of respondents who use the internet (35%) worry about governments checking their online activities. Users of multiple social media platforms, especially Twitter, are more likely to be worried about governments checking their online activities than non-users, yet this does not appear to curtail their use of social media. Social media are not used strictly for socializing; respondents see social media as important sources for news and information (62%). However, there are clear reservations about the reliability of information on social media and direct messaging (46% and 45%, respectively, consider reliable). By comparison, roughly two in three consider TV a reliable news source and just under half consider newspapers reliable. The extent to which social media are used for news and information is strongly correlated to age. 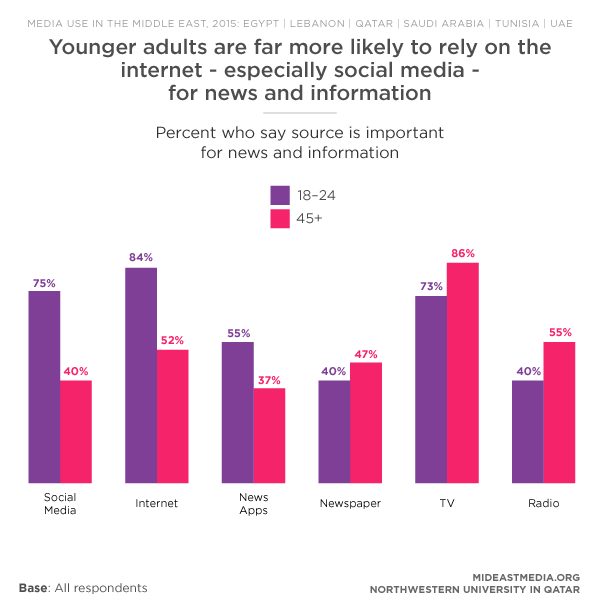 Younger adults are much more likely to rely on social media as an important source of news and information (75% 18-24 year olds vs. 40% 45 and older) and are more likely to consider it reliable (53% vs. 30%). Only a handful of social media users in the region are “passive” internet users who do not post. Nine in ten post messages or comments, repost content generated by others or share their original multimedia content (89% each). Younger social media users are more active than their older counterparts; nearly all (95%) ages 18-24 post messages or comments on social media compared to 76% of those ages 45 and up. Not only are people sharing personal content, they also use social media to disseminate news. Six in ten (60%) nationals share news content online, and nearly half (49%) do so via social media. However, sharing news varies widely within the region; about three in four in Egypt and Saudi Arabia share news content while only one in three Qataris share news content online. 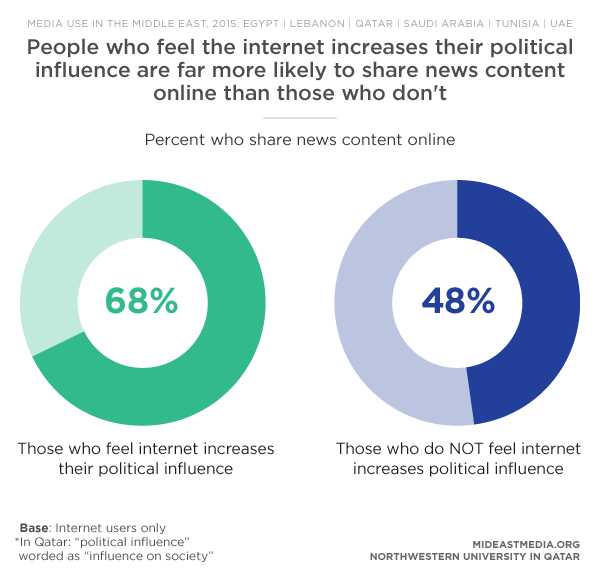 Forty-seven percent of internet users in the region feel increased personal political influence through their internet use. Those who feel politically empowered by the internet are significantly more likely to share news content than those who don’t. Sixty percent nationals who use the internet say it increases their contact with friends and half say they have more contact with family (59% and 50%, respectively). The internet increases contact with people who have similar political and religious beliefs according to four in ten respondents (41%). Saudis are most likely to say the internet positively impacts their contact with others, especially those with similar interests. The perception of increased social contact due to the internet is less pronounced among Egyptians and Tunisians. 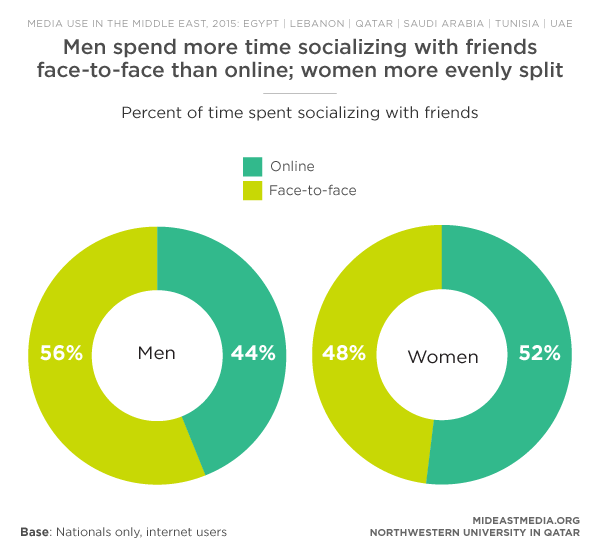 Arab nationals spend considerable time socializing online. On average, nationals spend about 12 hours per week interacting online with friends, and another seven hours interacting with family. Younger adults, ages 18-24, spend more than twice as much time socializing with friends online than those 45 and older (15 hours vs. seven hours). The younger segment also socializes with friends more offline (17 hours vs. 12 hours). Both age groups, though, spend similar amounts of time with family online (seven hours for younger adults and six for older adults), but older adults are slightly more likely to socialize in-person with family (27 hours for younger adults vs. 31 for older adults).